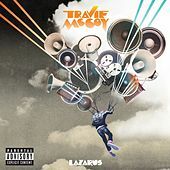 Travie McCoy built his career by blending skate-rap swagger with an earnest emo-pop vibe in Gym Class Heroes. Alas, much like that group's offerings, Lazarus is also split between hits and misses. When his formula works, the results are impressive: "We'll Be Alright," "Billionaire" and "After Midnight" sound like radio sure shots. Other songs like "Critical" and "Need You" overreach with broad themes and syrupy sentiments. Despite Lazarus' familiarity, McCoy hides a few surprises: On "Akidagain," he reminisces about old-school hip-hop over an interpolation of Ahmad's "Back in the Day." 2010 Fueled By Ramen, LLC. for the United States and WEA International Inc. for the world outside of the United States. All Rights Reserved.